REUTERS/John Sommers IIU.S. Senate Minority Leader Mitch McConnell addresses the crowd during a campaign rally in Louisville, Kentucky, November 1, 2014. McConnell was running against Democratic Senate candidate Alison Lundergan Grimes. 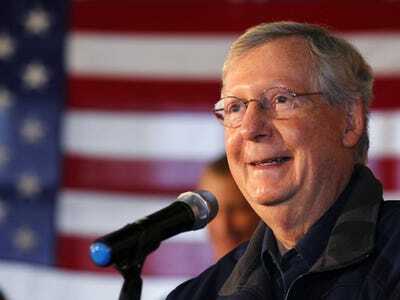 Republicans received a key win immediately after polls closed in Kentucky’s US Senate race, with Minority Leader Mitch McConnell (R) projected to win another term, according to the Associated Press. McConnell was facing off a spirited challenge from Democrat Alison Lundergan Grimes. Other media organisations, including CNN, also quickly quickly issued projections agreeing with the Associated Press. McConnell’s race was one of just several states where Democrats were hoping to play offence and his expected victory is a clear boost to Republicans who are hoping to retake the Senate on Tuesday. Indeed, forecaster Nate Silver said his own model now gives the GOP a 78% at controlling the chamber.